You are at Home Recipes Wow Your Guest with This Easy Salmon Wellington! Looking for an easy but impressive dish to make for the holidays? Look no further!! 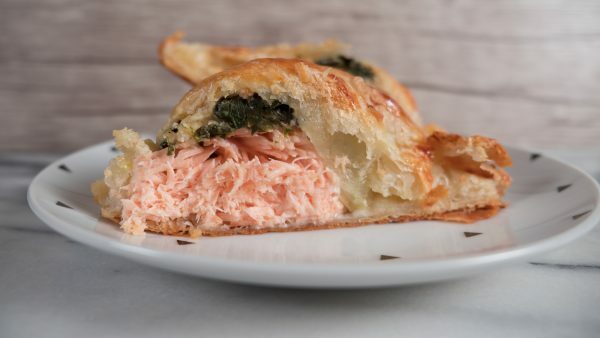 I promise you that these salmon wellington will impress your guest. And best of all, it is very easy to make so you don’t have to be in the kitchen the day day and not enjoy the holidays yourself. Wishing you a Happy, stress free holiday! In a pan over medium heat, add olive oil to pan and add garlic and onion. Sautee for 1 minute. Add spinach and stir around until wilted. Add cream cheese and combine. Turn off heat and let mixture cool. Using a sharp knife, score a pattern into the dough (lightly so it doesn't cut all the way through). Brush with an extra layer of egg wash.
Bake in preheated oven for 7 minutes, flip the pan 180 degrees and bake for another 7 minutes. Depending on how thick your salmon is, you might have to bake it for longer or shorter. To ensure your salmon is cooked through, use a thermometer and check the temperature of the fish in the thickest part and ensure it is 145 F.